Two teams of total contrast to say, One team heads the points table and the other just languishing in the bottom of the table and really finding difficult to find back the form. Sachin won the toss and decided to bowl first, With the formidable team to backup, he can merely ignore them. Mahela being the new captain for KXIP, (Dont think Sangakarra was removed from the squad bcos of his performance) he is fined for the slow over rate, Remember last match he took 1.45 hours to bowl 20 overs. Another fact to add, Today, Sachin took almost the same hours to bowl…. So keep ur eyes open for a MI, May be without Sachin for the next match, r just some fine will do too…. KXIP 163/10 in 20 overs. MI 164/6 in 19.3 overs. MI WON THE MATCH BY 4 WICKETS. After a commendable bowling performance, Mumbai began well the chase, as Sachin became the highest run getter in IPL and now the proud owner of Orange Cap. (Seriously Orange doesn’t look cool with dark blue, Whatever), Just when he crossed Kallis, he was caught in long on and had to head back to pavilion, Pollard walked in at no.3 to all surprise, Both Dhawan and pollard played out another 5 overs and scored the required run rate score, in the brief innings Pollard had a go at chwla, taking him for a four and six. Bopara came in to bowl and he did pick Dhawan who just completed his fifty. All of a sudden runs dried up and KXIP started feeling they are having the chance in the game, As Rayudu walked back to a soft dismissals followed Bravo, after a highest six(not longest)… With 3 overs to go 31 to win, Tiwary and Satish sticked together and got the necessary runs and held their nerves, Eventhough Tiwary was out in the last ball of 19th over, Sathish kept himself cool and faced Brett lee and did score 6 runs which is necessary to take Mumabi Indians home (Thanks to sloppy fielding from KXIP), to the joy of Mukesh Ambani, whos jumping in the lobby. To mention eventhough KXIP got the necessary runs r either their Bowling was good, Fielding so poor, which has totally let their team down. 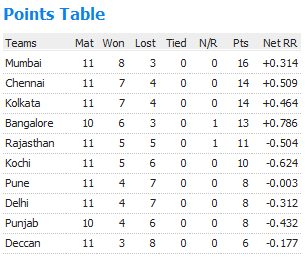 Mumbai Indians won the match by 4 wickets and points table will have no reflections just other than the increased points for Mumbai Indians. – Shaun Marsh scored his 6th IPL fifty. tied with KKR for the same record. 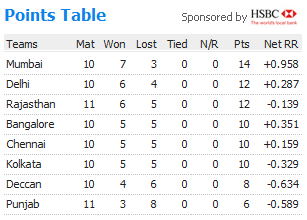 – 15 out of 26 matches are won team batting first, and lst 4 games are won by team batting first. 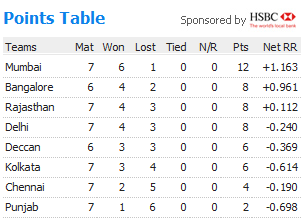 – KXIP concede 8.62 runs per over, as u could expect worst in IPL 2010 by any team. – MI just broke the record by having 32 balls without boundary, which will be the highest of this season now. – 21 extras conceded by MI is the highest number of freebies offered by any team, KXIP held this record with 18 extras. – After 19 days, Kallis’s Orange Cap has been taken by Sachin Tendulkar, he went past 310 of J.kallis. – Malinga’s figure 4/22 is the second best of this IPL season, just failed to better his fellow countryman Angelo Matthews 4/19. Orange Cap – Sachin Tendulkar (314) followed by J.Kallis (310) and Yusuf Pathan(250). Purple Cap – M.Muralitharan (11) followed by S.Malinga (10) and Shaun Tait (9). Another Double header day in IPL, and its 25th Day in IPL season 2. A game of pride for KKR and a must win game to see themselves in semi’s for RCB. McCullum won the toss and decided to bat first, Yep, to say, it was the day of Brendon, he did extremely well, lead from the front with a superb knock of 84 not out. well supported by David Hussey. with a fabulous innings from these two, KKR reached their highest score of the tournament 173 in 20 overs, which looked so much competitive in the pitch. In bowling, Vinay did pickup couple of wickets in the beginning, but they failed to strike in at the important times. Its always tough chasing a score of 174 for the opposition, yes RCB felt tat so, they went for the shots right from the beginning, kallis and ryder gave a good opening partnership, before McCullum took a stunning catch (i guess it shud be the catch of the tournament as of now) of Kallis to send him back to pavilion, and with 2 other quick blows, KKR really looked like winning their second game of the season. At a stage RCB needed 94 of 48 balls, which is almost at the run rate of 12 an over. But it all looked so easy for one man from Kiwi land, Its ross taylor, who took KKR by horns and left them pampered in the end. scored a winning 81* of just 33 balls. Bowling wasn’t worth mentioning except karthik who did trouble the batsmen a bit, rest a simple sorry performance. Spare a thought for this gentleman, Brendon McCullum, He made a valiant knock of 84 runs, took a blinder and did his job perfectly, but still then they lose the match. Nothing more to say for this poor guy, guess he has having a bad time, try out Indian pooja’s it shud work u Brendon. A much need game for both here, team which ever wins will look close to semi’s…. Yuvi won the toss and decided to bat first, but it didn’t prove worthy, since all KXIP batsmen had a cat walk from ground to pavilion, only sunny sohal had some guts to play some shots, rest all just made their special appearance on the screen, Pathan dreadful runout, Yuvi’s ridiculous shot, Sohal’s casualness…. Oh dear oh dear all proved very costly for KXIP, they ended up scoring just 119 in their 20 overs. A special mention has to be made for the stupendous bowling display by Bhajji and JP Duminy, who really bowled well and picked up the crucial wickets in the right time. Just Needing 6 an over, it shud be a easy job, but MI was well aware, they have fallen short of 3 runs to the same target and to the same opposition, as expected KXIP spur a surprise by picking jayasuriya very early for just 4. Actually MI 11/1 in 4 overs, but it is to blame on Sreesanth who bowled a very poor over, giving away 21 runs in the over, which really turned the game to Mumbai’s way, even though they lost rahane later, but it didn’t matter for Master blaster and Bravo to take home safely, with more than 3 overs to spare. MI won the match by 6 wickets. – Piyush Chawla became the third player in IPL to be idsmissed without even facing a single delivery. – Both Bredon McCullum and Ross Taylor recored their highest score of 84 and 81 respectively for this season of IPL. Its also their first 50+ score in this season. – 174 is the highest score recored by KKR in this season, they bettered 154. – 19, 18, 17 all these are freebies given by KXIP in the last 3 games. – 2.25 is the best economical figures ever recorded by Bhajji in T20 cricket. – Piyush Chawla became the third player in IPL to be dismissed without even facing a single delivery. – Both Bredon McCullum and Ross Taylor recorded their highest score of 84 and 81 respectively for this season of IPL. Its also their first 50+ score in this season. 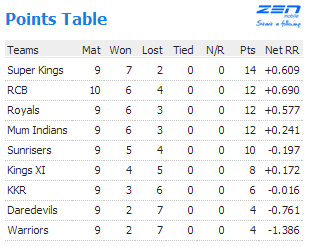 – 174 is the highest score recorded by KKR in this season, they bettered 154.